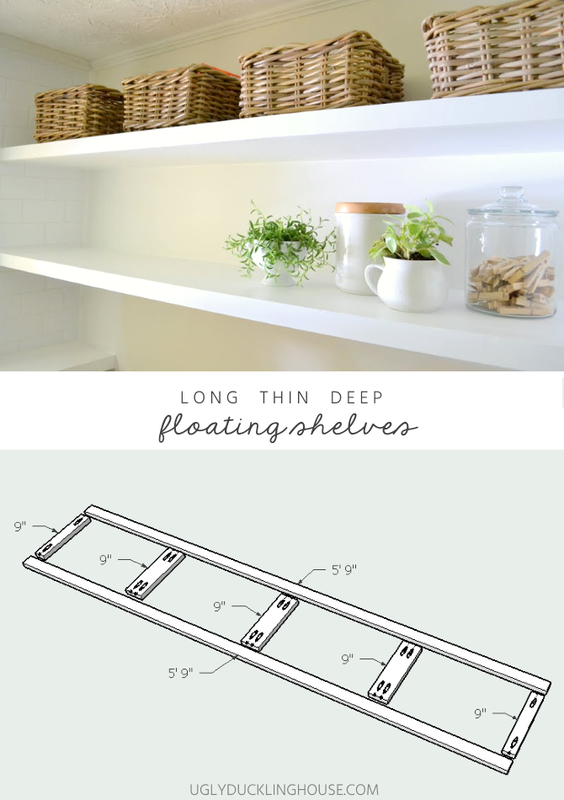 In this easy tutorial, I share free plans for how to create long and thin floating shelves with inexpensive materials. Plenty of support — without the bulk! The thin floating shelves in the laundry room are now 100% done. And with these crossed off the list, I can finally start using them—which also means that I can finally make the cluttered floor of “Mount Washmore” a thing of the past and gain some extra storage. Long. Deep. Thin. Inexpensive. Secure. I spent a while looking, but I honestly had a hard time finding one that had all of these in one. My biggest issue was that most floating shelves require the frame of the shelving system to be rather thick if they’re going to be as long as I needed mine to be. And I may be alone in this, but I do. not. like. 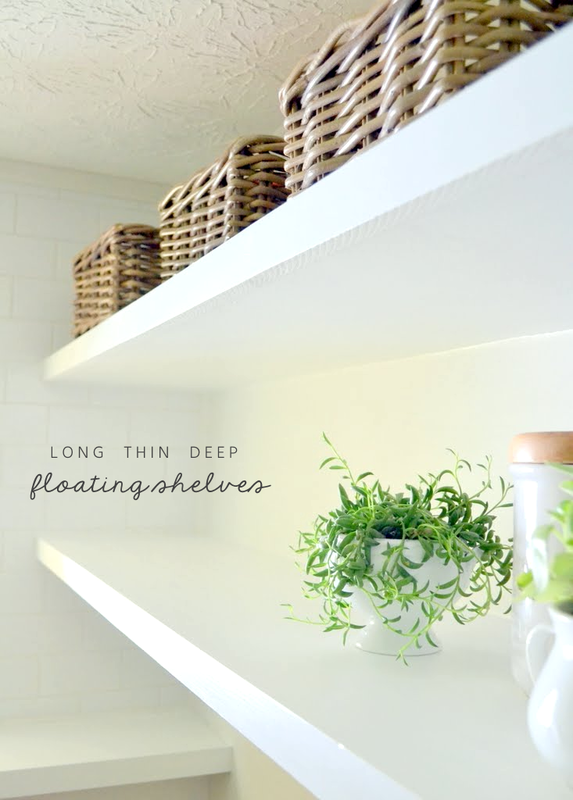 “chunky” floating shelves. For me, certain things are meant to be chunky—like a baby’s legs and cookie dough ice cream. And some things just aren’t—like peanut butter, Leonardo DiCaprio (sorry #dadbod fans), and my floating shelves. I get that it’s a combination of personal taste and function. A certain thickness is to be understood for the sake of getting a long, wide shelf to be sturdy enough to last with a reasonable amount of weight on it (and without bowing in the middle over time). The inner structure has to bear the weight, and shelf thickness is often just a byproduct of that. Or some people just like them that way, and that’s good too. But considering that my laundry room space is really, really tight (and awkwardly shaped), I simply didn’t like the idea of thick, chunky shelves taking up the view. What wasn’t so simple is figuring out how to make something thin support a lot of weight…like chicken legs on bodybuilder. So, I worked on the idea for a bit and combined tutorial ideas that I spied on Pinterest until I came up with something that worked for me. And a lot better than the whole bodybuilder thing. So let’s get on with the tutorial, shall we? My shelves were surrounded on three sides by walls; the entire tutorial is pretty much contingent upon that fact alone, so if you are trying to secure these on a wall that isn’t at least surrounded on two sides with studs or a place to put anchors, you may have support issues. To begin, mark the spot for your shelves along the wall. Using painter’s tape will help you visualize each shelf for placement and spacing. Remove the tape, then use a level to mark a pencil line along the entire wall to use as your level edge for adding the support (basically, you’re going to match the straight edge of the top of your support with this line). Each of my shelves (on the right side of the picture above) were approximately 69 inches long and 12 inches deep (I know, it sounds like the setup for a joke, but it’s true). The best part though is that the thickness of each shelf is only 1.5″, and still super sturdy!!! By using a 1×2 on its thin side, I was able to keep the shelf thin but still provide a supporting structure. It’s also the reason why I created a full 4-sided frame rather than just installing the cleats and middle supports through the shelf; other floating shelf tutorials do not include the 4th piece in the front, which makes sense to me, but I found that it really came in handy for keeping the middle pieces secure, level, and ultimately supporting the plywood on top. The frame is pretty easy to make; I used 1x2s for the sides of each shelf, cut to length for the back and front pieces (so 69″ or 5’9″ long) and width for the sides, minus the width of the front and back pieces (I wanted 12″ wide shelves, but the actual width of 1x2s are 1 1/2″ wide, so that meant only 9″ for the side pieces). I experimented a little with the inner pieces of each shelf though, first trying 1x2s on the lower shelf and some scrap pieces of 1x3s on the top shelf (so you’ll see some differences in each shelf’s structure in my pictures). I found the 1x3s to provide a much sturdier frame when using in combination with the Kreg Jig, so I’m recommending that you use this structure as well. I’m still very much a beginner with Google Sketchup (having done only one other post ages ago with it), so hopefully this makes sense! And just because I’m new to SketchUp, I thought I’d give you a color-coded version as well. Blue and white are 1x2s (9″ and 69″ long, respectively) and the green is 1×3 (9″ long). The holes for all of the Kreg’d pieces were done before installing on the wall, but I wound up taking the side cleats off for the next few steps before putting it back together (I still recommend doing this since it makes screwing things back together much easier). For beginners, you might not be familiar with the term “cleats” – but these are usually the pieces that screw into the wall and help support/distribute the weight. I’m also a DIYer who uses whatever convenient term that pops into my mind, so cleats, frame, supports, etc. all share a similar meaning for me in this project. Essentially, what I’m doing here is turning these cleats into more of a frame so that there are other parts that also help support weight, but it all relies on how securely these first few pieces are installed. You’ll want to make sure these are nice and secure by either screwing them into studs or using wall anchors on all three sides that attach to the walls. I first began by installing these pieces on each side—the tile wall first (since it would be the least forgiving), and then the opposite wall using wall anchors. Be sure to leave a gap along the back wall for the back piece of the frame to fit in snugly (1 1/2″). Tip from Pretty Handy Girl: Use Cobra Triple-Grip anchors for a solid hold. This needed a tutorial of its own, so you can find that here. With the longer pieces of each shelf cut to 69″ each, I used some remaining scrap 1x2s and 1x3s to fill in the middle section of the first shelf. I drilled pocket holes using my Kreg Jig and 1 1/4″ screws (determined based on the thickness of the wood, which is 3/4″). Use wood glue too (but only once you’re sure of how things will be installed; I had some trial and error figuring out each step, so I’m glad I waited to use wood glue!). As I mentioned above, I found after installing the first shelf that I liked the 1x3s for middle support better, so I recommend using them as you can see in the diagrams above. Tip: Face clamps are your best friend; if you have a Kreg Jig, I highly recommend using their face clamp for projects! I wound up not having enough scrap 1×3 laying around for both shelves, but I found that even with only 2 supports in the middle (I eyeballed the spacing), it was still very solid. With the side cleats installed (remember to leave a gap to fit the back piece), screw in the back cleat and rest of the frame to studs in the wall. The front piece can either be screwed into the middle supports already or put on last; I wound up trying both ways and didn’t find that there was a significant difference (either way, the whole thing was still somewhat cumbersome to install by myself because of the length). Tip: A brad nailer is a great substitute for a helping hand; it allows you to temporarily tack up the shelf support and get things level before screwing everything into the studs. With the frame in place, you can then add plywood. Since I don’t have a table saw in my garage right now, I had my local Blue cut down a piece of 1/2″ sanded plywood and 5mm sanded plywood to 12″ lengths for me. The rest of the cuts I did at home using my circular saw and a piece of scrap wood clamped to the plywood to use as a guide. 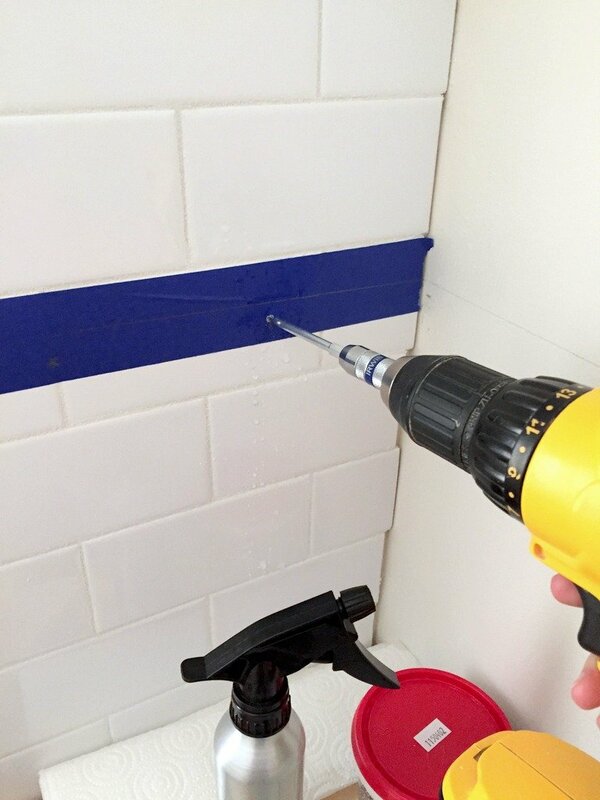 Tip: Use painter’s tape to help keep a clean edge when cutting plywood. For the underside piece of plywood (the thin 5mm stuff), I was able to cut it down with a utility knife quite easily (sidenote: OLFA** sent me several of their utility knives to try out this summer, and I’ve found that I prefer this utility knife to the rest. It’s my new go-to tool—great for small molding projects, and I’ve found that it’s been the leading reason why there are no more cardboard boxes in this house anymore*). I attached the top piece of plywood with wood glue and my brad nailer. The bottom piece needed some clamping before it stayed up, so I used a few brad nails strategically to hold things in place toward the back and clamped the front while the glue dried. When all pieces are attached, they wound up being just shy of 1 1/2″ thick, so I was able to use another 1×2 for the front to hide the plywood edges. You can also see two other updates in these pictures: one, I added the rest of the trim around the tile to complete the back wall too (which looks a LOT better than before! ); and two, I have begun RE-painting the walls. That makes this the third color I’ve put on them since moving in, and worth a serious eyeroll for taking so many tries to find what works, but I’ve known for a while that the color I’ve been using in the rest of the house simply wasn’t working with the lighting in this room. I tried to hold out as long as possible to see if I could live with it. But once I started painting the shelves, I figured now was the time to see if a leftover gallon of white paint I had from my office would fit—and it did! I’m now convinced that my search for the right color in this room is over. I’ll have more on that when it’s all finished. And for those wondering, the baskets I’ve added to the room are from Ikea and are VERY old, but they seem to work well in here. The white container on the right is an old kitchen container from Goodwill that I snagged last weekend (maybe a cookie jar?). It now holds my ugly detergent pods, which are nice to have hidden. So, that’s it for now. I still have to do some trim work, paint things, and have a decorative project in the works for this room, which I’m hoping to finish up later this evening. I’m loving the way it’s turning out, so it may be the right project to work on while the forecast is predicting rain for the week. More on that soon, and you can catch sneak peeks on Instagram if interested. *I have honestly been addicted to cutting up cardboard boxes lately because this knife cuts so well. Is that weird? That’s weird, I bet. But it’s also strangely satisfying, and my garden bed needed a lot of cardboard to help kill off the grass before laying down mulch, so this odd little obsession worked out great (it’s still mostly just the pure fun of cutting through each box like a tiny samurai sword, though). **Full disclosure: As I mentioned above, OLFA sent me a package of products to try out and asked me to share those thoughts on the blog once I’d tried them. But, as always, all thoughts and opinions expressed on this blog are 100% my own, and I never share something unless I really do like it. I had the same issue – I needed long shelves that could hold a decent amount of weight and I wanted them to be as thin as possible. I purchased 24″ wide, slab style , hollow-core doors. I split them down the middle, then slid them over cleats I attached to the wall. I used glue and brad nails to fasten them to the cleats. I ended up with completely finished front edges. They’re 1 3/8″ thick and, so far, they’ve worked great! I nearly did the same thing! But I couldn’t seem to find hollow core doors that were cheap enough in comparison to the cost of the plywood. If you got to the closest Habitat for Humanity ReStore you can find hollow core doors for $5-$10. A lot of times they are not marked. I ask the worker for the price and I specify I am using them for scrap or for sawhorses. This changes them from doors to plywood and you won’t pay a lot. They look amazing.I always appreciate your tutorials as they are very understandable and clear. Can’t wait to see the color you’ve chosen! These look amazing! So glad for this tutorial. We’ve been needing shelving in some rooms for a while now, and these look sturdy without taking up too much space. Thanks so much for sharing! Very cool and well done project. These would look great in our laundry area. Unfortunately, we’re missing the two side walls for support. im very glad to see this post. i learned how to make shelf and im waiting for the day to make it practically. I was trying to do something like this for my wife and the results did not come out as expected. I scrapped the project and am now starting over. I ran into an issue on the side cleats. I don’t have any studs that I can drill into for my sides. I might possibly be able to get one of the corner studs, but after that my next stud is 18 inches away. Any suggestions? Check out the section “About the side cleats” in the post. I had a similar issue with no wall studs in a couple of spots, so I used wall anchors instead. I made product recommendations as well, so you’ll know which kind to get! Good luck! Thanks for the quick reply. Just one more question. So do you put your anchors in the wall and then place the wood over the top of the anchor? Then drive your screw through the wood and then to the wall (assuming they both line up). Will the anchor engage properly even though your screw will not be flush to the wall since it will stop at the wood? I typically pre-drill through the wood & have it poke out a little bit to mark the drywall, which lets me know where to put the anchor and has a much better chance of lining up. Switch out the screw from the package for a longer & better one to go through the wood & secure into the anchor. If the screw stops at the wood, it’s too short. How do you use a 1×2 to cover plywood on the front of a 1.5″ shelf? Did you cut the 1×2 down to a 1×1.5? Nope, the term “1 by 2” is what’s called a nominal size. Basically, it’s called a “1×2″ even though those aren’t the exact dimensions of 1 inch by 2 inches; instead, it’s actually 3/4″ by 1.5”. I’ve read that it comes from the “rough sawn” cut at the lumber mill, which is a true cut to the dimensions, and then when the board gets planed down for use, it becomes its actual size of 3/4″ by 1.5″. So, the 1×2 piece was 1.5″ wide all along, and it didn’t need to be cut down except on the ends to fit the length of the shelf (the length of wood, such as a 1x2x8, is still the actual length of 8 feet… crazy, I know!). I should actually write a post about it just to explain some basics about working with wood, so I’m sorry for the confusion, but thank you for inspiring a new post! Love the way these look but I’m confused on the front edge. How did you use a 1×2 to cover the front of a 1.5 Inch shelf? Thanks! I’m curious how far from the ceiling your top shelf is. I am having a hell of a time trying to decide how close is too close! The space measures about 14 inches from the ceiling to the shelf. What an awesome tutorial! Thanks for all the details. I was a little overwhelmed trying to figure out how to do this myself, but you’ve broken it down in easy steps that even I could probably follow! Now I guess my question is much more utilitarian…how much weight does a lighter thinner floating shelf hold? If you give up thickness due to size constraints and personal preference how does it impact its usage? I want to build floating shelves above my computer since my wife is a home schooling mom but I am concerned that thinner shelves will give up weight capacity and storage load. It all depends on the support it’s got. I used heavy duty drywall anchors on the tiled wall and the rest of the supports were screwed into studs, so considering that the shelf is screwed in on three sides, it’s a VERY sturdy shelf despite the lack of thickness. I didn’t stress test it or anything, but they definitely aren’t coming down anytime soon. If you have to use wall anchors like I did, note the weight capacity limits mentioned on the package. 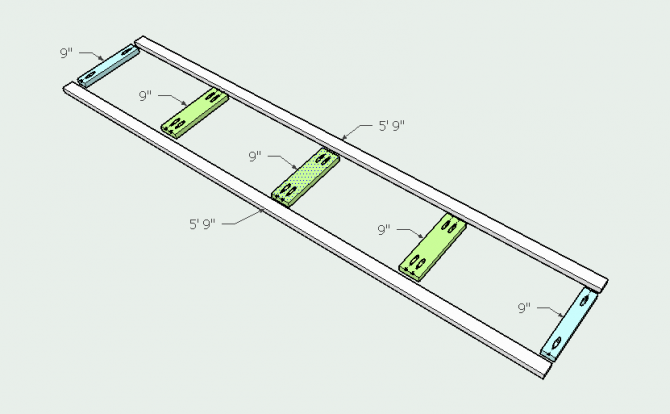 Just curious: if I wanted 16″ deep shelves but 1 1/2″ thickness, using the same materials and method as yours, would that still be sturdy or do you think going 16″ deep compromises the sturdiness? I need my shelves to be deep to house blankets/linens/towels, but also want to avoid the “chunky” shelves. Thoughts?? 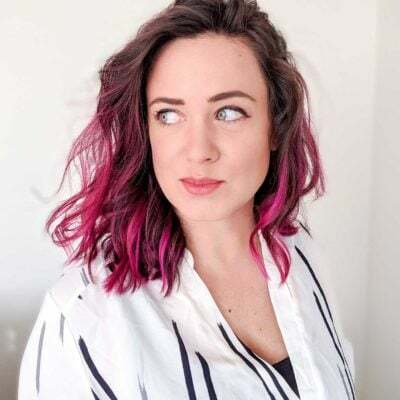 It’s hard to give advice on what-ifs that haven’t been a scenario I’ve had in my own house (given that most projects are ones that I’ve only done for my specific circumstances), but I think it heavily depends on how many sides are supporting the shelf. 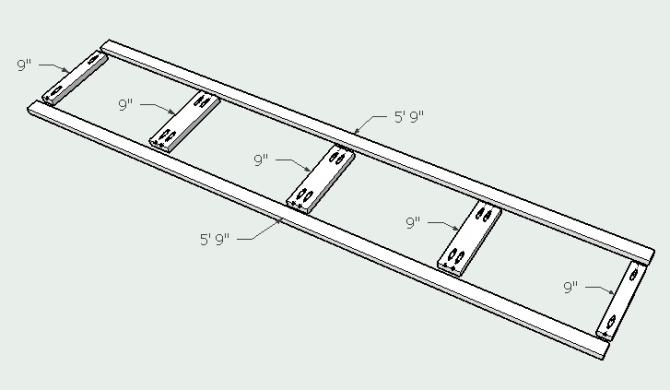 If it’s on three sides like mine and screwed into studs on all three sides or heavy duty wall anchors (on the box, it will say a weight limit), you can still create deep and sturdy shelves, though I couldn’t say to how much weight. The challenge with floating shelves lies in where/how the middle area gets supported, because the deeper shelf means that the middle section has less support. If I were worried about it enough, I might actually use a low-profile metal shelf support or a “countertop” bracket in the middle that could then be painted to match the wall color to blend in. The linens would potentially hide the visible support even further but would put my mind at ease about the shelves falling down! Hope that helps! Great tutorial! I am working a set of these shelves in a corner in our laundry room. My shelves will be 72 1/2 in long and 12 inches deep. Plus 18 in past the corner so they will be L-shaped. I only have the corner and not 3 sides so I am hoping they will be sturdy enough with this configuration. I may add an extra support 1×2 between the shelves for added support. One question: I was a little unclear how you attached the long back cleat to the wall. Did you use wood screws to attach to the studs and/or wall anchors to attach to the drywall? The back ones were just screws sent through the studs. You ideally only want to use wall anchors when you have to (when studs aren’t in the spot you need to screw into). Hi Sarah, pretty looking shelves. 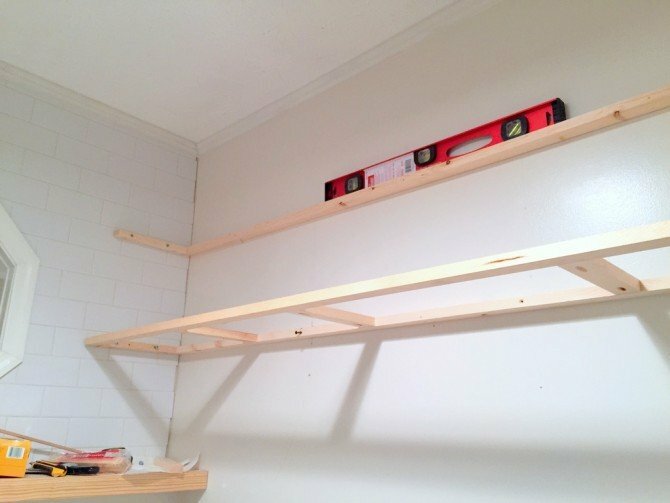 How deep do you believe you could make shelves with the same framing materials you’ve used while still retaining sturdiness? I couldn’t say; I’m not a professional installer. If you used 1×2 for the frame, then added plywood on top and bottom, how did another 1×2 front plate cover it all? I️ built a floating shelf using 1×4 box slid over a 1×2 frame, but my wife says it’s too thick of a shelf and she’d like a thinner shelf for where we’re using it. I’m trying to figure out how to do floating shelf that when said and done, is only 2 inches thick. So I like what you did, just tying to figure out how you got the 1×2 front plate to fit. Double check the photos and the plan… the 1×2 is turned on its side so that the thinner 1″ width is what is used for the frame. Then the 1×2 on the front is turned so the 2″ width is the face. That means you can really use ANY 1x for the frame, 1×3 or 1×4 could also be good supports. I suspect you’re turning the 1×2 in the wrong direction. Good luck! I know this is an old post, but hopefully you will see this comment. I love your shelves! I want to make some but need them to be 8.5 feet long and 12 inches deep. I would obviously put several more cleats in the middle. Do you think that would be enough to keep them sturdy and not sagging in the middle? Thanks so much! Wish I could give you a definitive answer, but I don’t have any experience with installing a shelf that long, so you’ll have to use your judgment on that! I built this design specifically for my home’s needs, so my little alcove area does a fantastic job of supporting the shelves the entire length. When shelves are suuuuper long, there’s always a chance it could sag in the middle over time. It would also depend on what you put on the shelf, too. This is awesome!! Great level of detail. I will hopefully be at the level to do this one day. But sooooo far from there right now!!! Right now I am just looking to install a wire shelf over the tile in my shower. Your provide great details that would make that possible. But I do have a question: How do you know what size screws you need to use (or, put another way, how do you know how thick/deep your wall is)? Thanks for any response/guidance! When in doubt, go for heavy duty wall anchors that have a greater weight load (listed on the package) than you ever think you’ll need. They come as a set, where the screw and wall anchor comes in the same package so you know you’re matching them up correctly. I cover wall anchors in more detail in this post.